Flying a drone indoors is always a challenge. You have to remain absolutely calm and collected, and generally, I highly recommend not flying a drone indoors, especially if you're new to them in general. That's also the warning that Filmmakers Guillaume Juin and Joris Favraud give anyone wanting to recreate this feat. They are a pair of rather brazen drone operators if I've ever seen any, coming together to form their company BigFly. Normally, the risk of flying a drone inside of a structure is already high, but usually, the highest risk is to the safety of your equipment, as the ease with which your drone could come into contact with any number of disastrous endings is increased exponentially. They didn't just pick any building, though; they flew inside of Saint Louis Church in Paimboeuf, the only Byzantine Church located in the northwest part of France. Equipped with their determination and vision, they set out to produce what would end up being a very striking and beautiful piece of video work, showcasing bits of the church that you wouldn't normally be able to see with just a simple visit. With some added smoke from a smoke machine to create the ambiance, they set out and began filming. BigFly's drone setup, the Gryphon Redback X8 with Ronin-M and Sony a7S II. Their equipment as it was used in this video is a Gryphon Redback X8 1200mm Aerial Platform, fitted with a Ronin-M, configured for upside-down mounting to give a clear view above the drone as it flies around, and a Sony a7S II. Guillame, the pilot, controls the platform itself, while his co-pilot, Joris, controls the camera and gimbal. Separation of the control helps maximize efficiency as well as helping to allow the pilot to focus on the movement of the drone and allowing the camera operator to focus on the control of the camera, ultimately allowing the final shots to be much smoother and more dynamic. 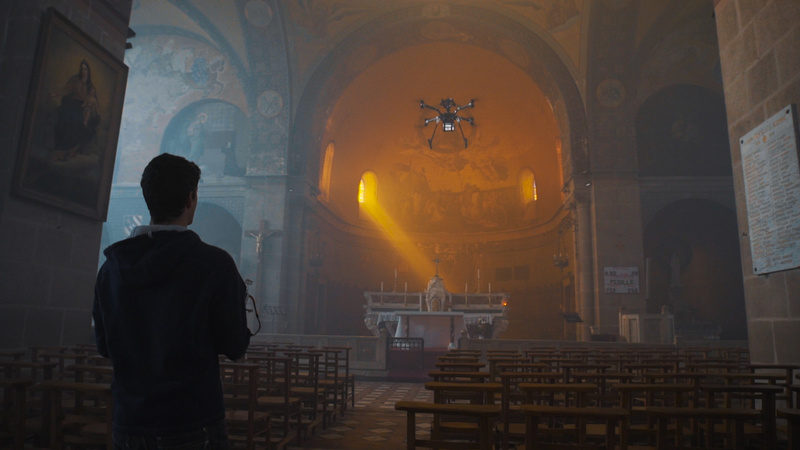 The drone pilot on the left and camera operator on the right, with the drone in flight in the church. This precision teamwork is hard-earned with a lot of hours of operation and practice, and it shows. The video is beautifully shot and edited and is definitely a wonderful example of how the right people with the right tools can produce wonderful pieces of work. 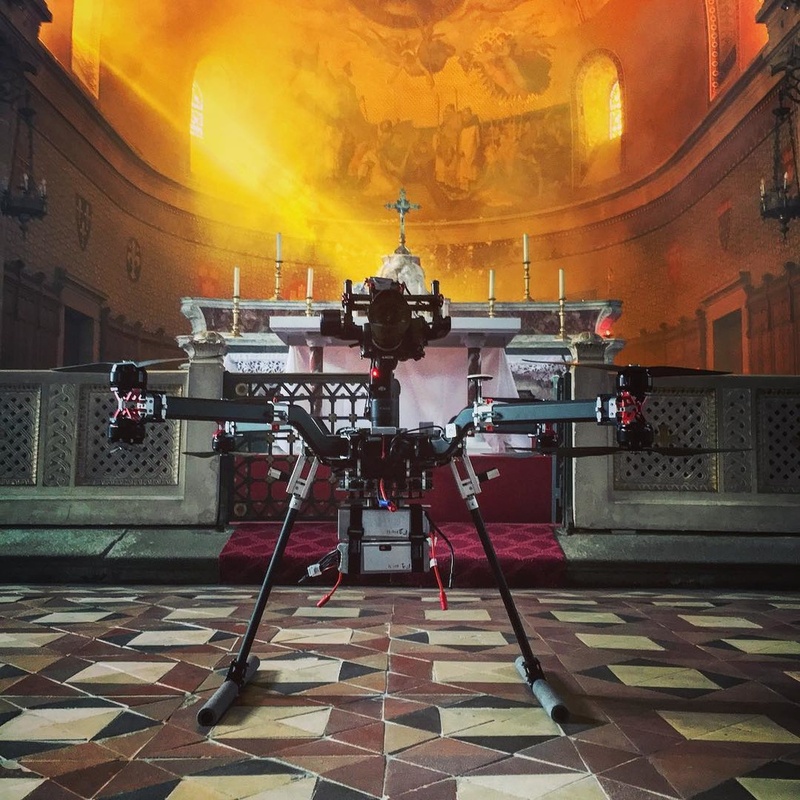 Upon asking about their experience while flying the drone inside the church, they commented that the experience was extremely stressful, and that any moment of distraction could have resulted in a crash, damaging both the drone and the church itself. Guillaume stated: "We had room to fly it, but I knew that it could go wrong at anytime. Just two seconds of distraction could lead to catastrophe." From the video they produced, I would say that they definitely were able to complete their flights without incident. 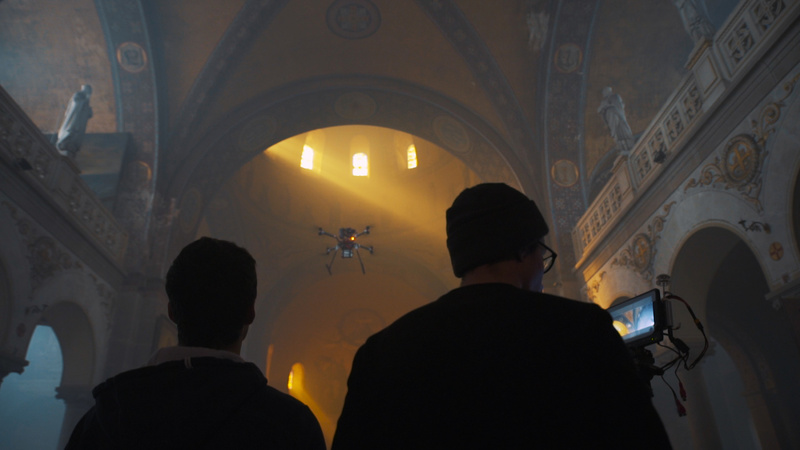 Drone in flight in the Byzantine church, piloted by Guillaume. 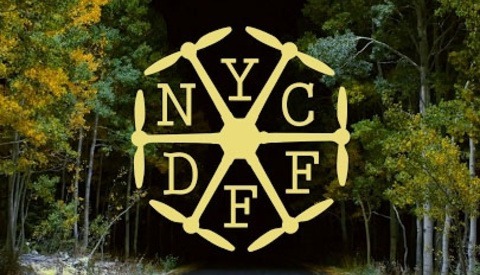 The video from this trip has been received worldwide with much applause, winning second prize in a drone festival in Poland and being selected in five festivals around the world, with more to come, I'm sure. In the future, the team at BigFly will be replacing their existing Ronin-M with something able to hold larger cameras like RED and Alexi Mini cameras. I don't know about you all, but I'm very excited to see what comes next from these two. If you ask them what sets them apart from other similar companies, they say they also produce full video productions from start to finish, but for more information, you'll have to visit their website and also check out their Vimeo for more of their work! Images used with permission of BigFly. Do you ever have anything good to say? Take away the music. You are left with some repeated cinematography. Content feels quite empty. I must have watched a different video than everyone else. 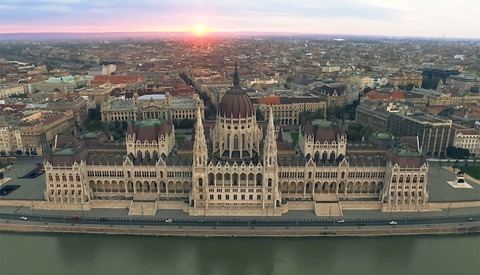 That beautiful footage is some of the most amazing architectural b-roll that I've ever seen. They could've straighten the horizon at 0:41 in post which was a degree or two off to the left. Nice location to shoot and loved the color grading on this one. God that opening shot! Great to see the behind the scenes shots, I thought it was a technocrane at first. Putting aside the content of the video...Its a stupid thing to do. Ok they are experienced drone pilots but sh*t happens to the best also! And I don't give a damn about the drone! Did they even consider what would happen if they did damage the church's interior? Who was the idiot that gave them permit (if they had one, that is)? I tried to find more info regarding the building with no luck. I don't thing it is a "working" church though, most probably it's an archaeological site. I'm absolutely certain that they had a permit (or permission from the keepers). That is professional, staged footage, not some pirate campaign. And yes, something could happen. Just the way something could happen when you bring in anything into that environment, like a people lifter to change light bulbs, or scaffolding to repair stonework, or move chairs that could damage the floors, or when the roof leaks (and I guaranty the roof leaks). These are living buildings that aren't as delicate as you think. All kinds of things go on inside of them. An experienced, bonded drone pilot probably doesn't worry them, especially when they will probably have rights to use that marvelous footage. What a bunch of arm chair critiques, the amount of skill that went into piloting this drone is unfathomable to me. Just look at that second shot! Could it have been better 20% slower, sure, that doesn't stop it from being jaw dropping. I couldn't have pulled this off, and for that I admire it. Thank you for sharing Ryan. Wow, so much negativity. I thought it was incredible. If not liking something is not a negative response then I don't know what is. I have seen some really naff drone footage in recent months. 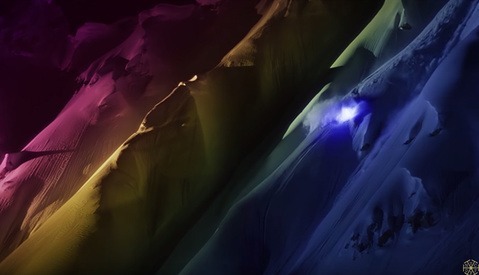 This footage was was both beautiful and skillfully made. The chosen music was atmospheric and created in my opinion a gorgeous ambiance and if I had made it, I would be pretty pleased with myself. It never ceases to amaze me the level of negativity and uninformed criticism that follows some articles here and elsewhere. It may not be to your taste; that's absolutely fine. If you don't know the facts however, is it necessary to be so virtuous? Hahahaha You Sir, have won the internet for the day lol. And the MUSIC? Anybody know what the music is? Some Eastern Orthodox hymn? Watch this without sound and the sequence falls flat. The series of clips makes no sense. There is no introduction to the view, no procession to the views, there is no story... It may as well be a cave since the parts to a cathedral matter and the film makers ignore that. You get no sense of the order of things. If I were the priests I would be very unhappy about the smoke chemicals saturating the interior of the cathedral as well. Truth be told, this is mediocre. They needed help with editing and story boarding. Being a photographer is not the same thing as being a film maker. It is a great effort and received some attention but push comes to shove and, as the article tells you, it was not a winner. Clearly though the pair have the skills and the drive to accomplish hard projects and this is climbing the rungs upward to the next project. Success beckons!